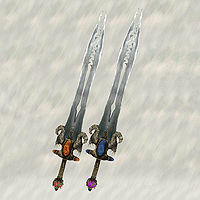 Dawnfang/Duskfang is a unique leveled sword of Akaviri origin with a unique look. It is an unusual weapon in that it really is four weapons in one. During the day (6 a.m. - 6 p.m.) it is Dawnfang, doing fire damage on strike. During the night (6 p.m. - 6 a.m.) it is Duskfang, doing frost damage on strike (Both do the same amount of damage). At dusk and dawn, the blade in your inventory will be replaced with the other. Nourish Blade effect: Each weapon keeps track of the number of opponents killed with the blade; providing you killed at least 12 enemies during the preceding 12 hour period, the next blade you receive will be Dawnfang/Duskfang Superior. You must kill 12 enemies in each 12 hour period in order for the following weapon to be the Superior version. Killing your own summons is a good way to obtain the 12 required kills. Like other enchantments, the Nourish Blade effect requires charges in order to successfully activate upon killing the enemy. The Superior version does have an increased enchantment charge and absorbs health (Dawnfang Superior) or magicka (Duskfang Superior) in addition to the previous fire/frost enchantment. Kills are attributed to the blade only if the blade delivers the killing blow. All four forms of the blade are leveled, but all four forms have the same stats at each level. It does not level with the player, it is only leveled to the PC's level when it is first received. Also, the sword will usually never have to be repaired or recharged, as each version comes at 100% health and fully charged. Dawnfang/Duskfang is received at the conclusion of the Baiting the Trap quest. The sword's enchantment will be recharged when it is replaced, meaning that you have to recharge it much less often, and can avoid doing so entirely if you simply switch to another weapon until it is replaced. Each time the sword switches between Duskfang/Dawnfang, it will be removed from any assigned hotkey. Grommok's Journal provides some background information about the sword. The journal states that the superior version of Duskfang did "more frost damage than normal", but the frost damage enchantment actually stays the same. Grommok actually carries a different version of the blade, called Grommok's Blade. If you drop either Duskfang/Dawnfang (voluntarily or by being disarmed), the kill count will reset to 0 when you pick the weapon up again. If you have Duskfang/Dawnfang equipped and are riding a horse when the swap occurs, you will keep the version you had equipped and receive the alternate form as well. The duplicate will have one less use than the original, and will disappear if kept in your inventory when the change occurs again. You can also sell the duplicate to a merchant.